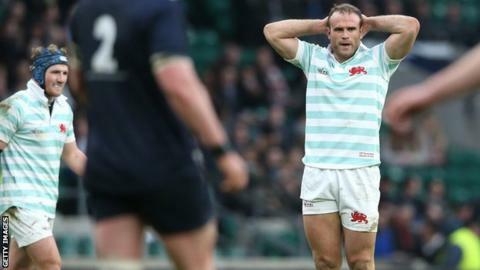 Wales centre Jamie Roberts was forced off injured as his Cambridge side were edged out by Oxford in the 134th Varsity match at Twickenham. British and Irish Lion Roberts, the first active international to appear in the fixture since 2009, went off at half-time after suffering a dead leg. Don Stevens and George Cullen traded penalties for a 3-3 score at the break. Stevens' kick then put Cambridge 6-3 up but three more Cullen penalties sealed Oxford's sixth Varsity win in a row. The Dark Blues, whose latest victory set a new record for consecutive successes in the 143-year-old fixture, have now also dragged the overall head-to-head score back to 61-59 in Cambridge's favour. Prior to his half-time withdrawal, Roberts had looked a potent ball carrier in a contest otherwise short on quality and action in either 22. The 29-year-old, capped 74 times by Wales, is now poised to join up with his new club Harlequins - and played down the seriousness of his injury. "It's only a dead leg," he told BBC Sport. "It got worse and worse as the first half went on, and I couldn't run after half-time so had to come off. "The guys chucked everything into it and we can't ask for anything more from them. "It's an amazing day, the pinnacle of student sport and for these boys it's their cup final. A few of the guys are in tears and it's very difficult." With their star player sidelined, Cambridge struggled to maintain their physical intensity after the interval and Oxford looked the more threatening of the two teams. Having contributed 18 points in last year's 43-6 success, Cullen kicked all 12 in 2015 to secure victory in front of 25,013 fans inside Twickenham. Oxford University: Geiger; Hughes, Janney, Lamont, Stileman; Cullen, De Berker; Anderson, Halpin, Williams, Taylor, Grant, Roberts-Huntley, Will Wilson, Heathcote. Cambridge University: Davies; Cherezov, Clough, Roberts, Rees; Gillies, Stevens; Briggs, Montgomery, Spelman, Hall, Nagle, Kilroe, Dass, Farmer.